An intensive formula with exfoliating, anti-acne and matifying properties. The three active acids prevent all causes of acne lesions, blackheads and skin imperfections. Thanks to its depigmentation properties the formula also has a positive impact on eliminating discolorations other than inflammatory and those of acne origin. well as normalizes sebum secretion by the sebaceous glands. The formula should always be used in accordance with the manufacturers indications. The Anti-acne acid peel should only be applied locally on the skin. Apply a few drops min. 3 times a week at night, avoiding the eye area. 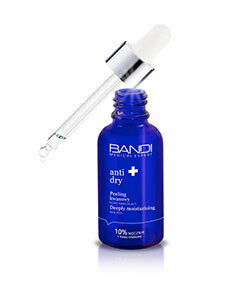 For best results use with other Anti-Acne line products.